Customers have admired our firm for offering Double Soap Dispenser. These presented dispensers are best in finishing and supplied in the market after complete inspection on various parameters. 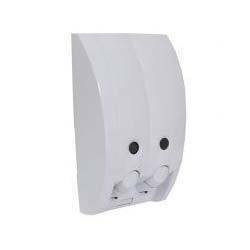 Best in finishing, these presented dispensers are quality approved by professionals before supplying in the market. These dispensers are available in the market at minimal price. Incepted in the year 2014, Martiza Hygine Solutions is a leading business enterprise betrothed in presenting to our clients a comprehensive spectrum of Automatic Fragrance Dispenser, Automatic Ozone Generator Dispenser, Automatic Hygiene System, Combination Cleaner, Cleaning and Dosing System, Soap Dispenser, Automatic Soap Dispenser, Paper Towel Dispenser, Automatic Air Fresheners, Automatic Hand Dryer, Automatic Waste Bin. Designed and manufactured with utmost perfection, our offered products are made in tune with the globally values standards of superiority. Making use of top notch basic material along with modern tools, these are developed under the assistance of trained executives.